Tattoo regret is a real phenomenon. I can’t tell you how many people call me the day after they receive their tattoo. Immediate remorse. 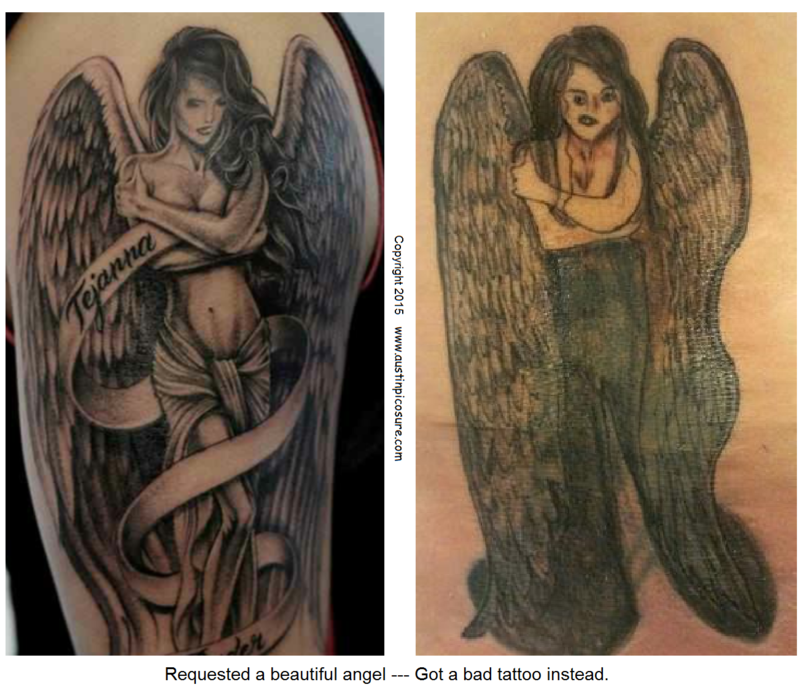 What’s interesting though is not that they regret getting a tattoo, rather they regret getting a bad tattoo. I had one such patient call me today expressing horrible regret over the tattoo she received yesterday. While we were discussing state of the art laser tattoo removal with PicoSure laser she texted me both the example picture she had provided the artist and the tattoo she had received. Now I’m no art critic but wow, what a bad tattoo. It didn’t look anything like the desired design – see below. My advice is: THINK BEFORE YOU INK! Even though it might cost more, go to a reputable artist with a proven track record. Make sure they haven’t cut and pasted their portfolio off the internet. Carefully consider the size of your potential cover-up tattoo. They’re usually bigger than expected. Give yourself time to imagine the tattoo on your skin. Consider that it will be there for life. Location, location, location. Will this tattoo be seen by others at work? Can you wear a dress or shorts or a tee shirt without your ink showing? What will your potential employer say? Do they have a policy banning visible tattoos? Many companies are moving that direction. How will a future significant other feel about your ink if it’s someone else’s name or a tribute to another person? My plainspoken advice is given from the point of view as an RN who provides PicoSure laser tattoo removal on a daily basis and has heard many different stories of regret. Sometimes the patients feel as though they made a mistake even getting a single tattoo. If you are having tattoo regret or simply would like to fade your design for a fresh new image, I can be reached by phone @ 512-479-9997 or just stop by my NEW location in Austin, TX: Austin Medspa on W. 6th St.